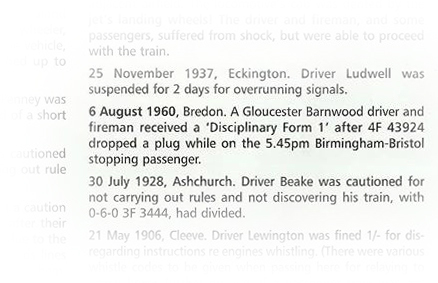 Further to our archive article about 43924, volunteer James Haley came across this magazine excerpt that shows the driver and fireman of 43924 in 1960 had some explaining to do whilst taking a passenger train from Birmingham to Bristol. The date shown is the actual date of the incident. Archivist, Paul Brunt, explains that a ‘Form 1’ is a request for information at the start of a Safety of the Line investigation to ascertain the details of an event. We will never know what happened at the subsequent investigation of the 6th August incident but if anybody knows the outcome we will be delighted to hear from them.